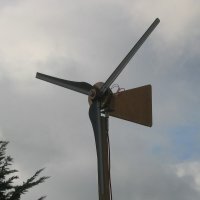 The turbine has been run up a number of times on windy days, but generally suffers from the sheltered and gusty conditions available. So far the highest charging current on the battery is just over 2 amps. The rotor seems to rotate faster than the original version which is to be expected as the blade angle is noticeably shallower. It does not, however, start up so easily in the very light winds, although this is well below the charging cut in speed so of no significance. The turbine has survived these mild conditions pretty much unscathed. The back of the blades are showing some scuff marks where they have hit the timber used for the tower. 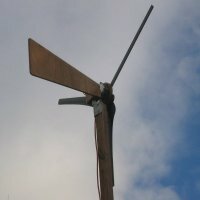 The blades can be seen to bend backwards in the gusts and the PVC gutter is probably too thin for blades of this length. It really needs a better tower with a metal tube for the top section, although if making the body again I would allow greater overhang at the front or angle the axle slightly upwards to avoid this.